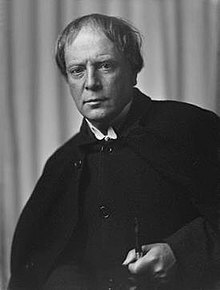 Arthur Machen (/ˈmækən/; 3 March 1863 – 15 December 1947) was the pen-name of Arthur Llewellyn Jones, a Welsh author and mystic of the 1890s and early 20th century. He is best known for his influential supernatural, fantasy, and horror fiction. His novella The Great God Pan (1890; 1894) has garnered a reputation as a classic of horror, with Stephen King describing it as "Maybe the best [horror story] in the English language." He is also well known for "The Bowmen", a short story that was widely read as fact, creating the legend of the Angels of Mons. Another sign of his rising fortunes was the publication in 1923 of a collected edition of his works (the "Caerleon Edition") and a bibliography. That year also saw the publication of a recently completed second volume of autobiography, Things Near and Far—the third and final volume, The London Adventure, being published in 1924. Machen's earlier works suddenly started becoming much-sought-after collectors' items at this time, a position they have held ever since. In 1924 he issued a collection of bad reviews of his own work, with very little commentary, under the title Precious Balms. In this period of prosperity Machen's home saw many visitors and social gatherings, and Machen made new friends, such as Oliver Stonor. Machen's popularity in 1920s America has been noted, and his work was an influence on the development of the pulp horror found in magazines like Weird Tales and on such notable fantasy writers as James Branch Cabell, Clark Ashton Smith, Robert E. Howard, Frank Belknap Long (who wrote a tribute to Machen in verse, "On Reading Arthur Machen"), Donald Wandrei, David Lindsay and E. Charles Vivian. His intense, atmospheric stories of horror and the supernatural have been read and enjoyed by many modern horror and fantasy writers, influencing directly Peter Straub, Stephen King, Ramsey Campbell, Karl Edward Wagner, "Sarban" (John William Wall), Joanna Russ, Graham Joyce, Simon Clark, Tim Lebbon, and T. E. D. Klein, to name but a few. Klein's novel The Ceremonies was partly based on Machen's "The White People", and Straub's novel Ghost Story was influenced by The Great God Pan. One chapter of the French best-seller The Morning of the Magicians, by L. Pauwels and J. Berger (1960), deals extensively with Machen's thought and works. Machen's approach to reality is described as an example of the "fantastic realism" which the book is dedicated to. Prominent members include Javier Marías, Stewart Lee and R.B. Russell of Tartarus Press. The society was nominated for a World Fantasy Special Award: Non-Professional in 2006. The Chronicle of Clemendy (1888) — fantasy tales within a frame story of a rural Welsh drinking fraternity with mystical roots. The Great God Pan (written 1890–1894; published 1894) — short horror novel. First published together with "The Inmost Light" as Volume V in John Lane's Keynotes Series. "The Inmost Light" (1894) — short horror story. A scientist imprisons his wife's soul in a shining jewel, letting something else into her untenanted body, but the jewel is stolen. "The Shining Pyramid" (1895) — short horror story. Strange arrangements of stones appear at the edge of a young man's property. He and a friend attempt to decipher their meaning before it is too late. The Three Impostors (1895) — a horror novel incorporating several short stories, including "The Novel of the White Powder" and "The Novel of the Black Seal", which have often been anthologised separately. Centers on the search for a man with spectacles. "The Novel of the White Powder" — a man's behaviour takes a strange turn after he starts taking a new prescription. His sister doesn't know if this is a good thing or a bad one. "The Red Hand" (1895) — a short detective/horror story featuring the main characters from The Three Impostors. It focuses on a murder performed with an ancient stone axe. The Hill of Dreams (written 1895–1897; published 1907) — a novel delineating the dark and mystical spiralling madness, awe, horror and ecstasy of an artist. Generally considered Machen's masterpiece. Ornaments in Jade (written 1897; published 1924) — prose poems, some of which hint at dark pagan powers. "The White People" (written 1899; published 1904) — short horror story. Presented as a young girl's diary, detailing her increasingly deep delvings into witchcraft. Often described as one of the greatest of all horror short stories. The Terror (1917) — short novel. Rural supernatural horror set in wartime Britain, where a series of unexplained murders occur with no sign of who or what is responsible. "Out of the Earth" (1923) — a short horror story regarding the malefic brutality of the mythical 'Little People', who are emulating World War I. "Opening the Door" (1931) — short story. Tale of a man's mysterious transcendence into some outer faery realm. The Children of the Pool (1936) — short story collection including the late period horror stories 'The Bright Boy', 'Change' and 'Out of the Picture'. "Ritual" (1937) — a short horror story about a dark ritual performed by children of some hidden London district. Arthur Machen & Montgomery Evans: Letters of a Literary Friendship, 1923-1947 (Kent State University Press, 1994) — correspondence. Constance Benson's autobiography Mainly Players (Butterworth, 1926) has an introduction by Machen, who had been a member of the Benson company from 1901 to 1909. ^ a b "Arthur Machen". caerleon.net. Retrieved 26 January 2017. ^ a b Hando, F.J., (1944) The Pleasant Land of Gwent – Chapter Nine, Arthur Machen, R. H. Johns, Newport. ^ E. F. Bleiler. "Arthur Machen" in: Bleiler, E. F., ed. Supernatural Fiction Writers. New York: Scribner's, 1985. ISBN 0-684-17808-7 (pp. 351–3). ^ Simkin, John. "Arthur Machen". Spartacus Educational. Retrieved 15 July 2018. ^ Arthur Machen, Hieroglyphics (London: Grant Richards, 1902), p. 11. ^ Glen Cavaliero, Charles Williams: Poet of Theology (London, Macmillan, 1983) p. 55. ^ a b "Machen, Arthur (Llewellyn)", by Brian Stableford in David Pringle (ed), St. James Guide to Horror, Ghost and Gothic Writers. London : St. James Press, 1998, ISBN 1558622063 (pp. 382–84). ^ Rusty Burke notes that Howard's early story "The Little People" is "clearly influenced by Arthur Machen's 'The Shining Pyramid'" (Rusty Burke, "Notes on Miscellanea" in Robert E. Howard, Bran Mak Morn: The Last King . New York: Del Rey/Ballantine, p. 193. ISBN 978-0-345-46154-4). ^ Long's poem is republished in Lovecraft's Supernatural Horror in Literature. See The Annotated Supernatural Horror in Literature, ed. S. T. Joshi (Hippocampus Press, 2000), p. 62. ^ Don Herron, "Collecting Donald Wandrei Archived 7 September 2008 at the Wayback Machine", Firsts: The Book Collector's Magazine, Oct. 1999: "Within a decade Wandrei began to write appreciations of his favorite writers. His article 'Arthur Machen and The Hill of Dreams' appeared in the Minnesota Quarterly in spring 1926, and led to an exchange of letters with the Welsh mystic." ^ a b c Gwilym Games (ed), Machenology: Tributes to the Master of Mysteries, 2007. ^ "In Conversation With Tessa Farmer" (PDF). Antennae. 1 (3): 16–24. 2007. Archived from the original (PDF) on 28 February 2008. Retrieved 28 October 2007. ^ "Arthur Machen and The London Adventure". 17 March 2009. Retrieved 11 November 2018. Joshi, S. T. The Weird Tale. Austin: U of Texas P, 1990. Wikimedia Commons has media related to Arthur Machen.